Myself, Sam, Andy, Chris, Ben, Brummi and the other Sam decided to have a weekend for the FA Cup 2nd round game at Southend, we stayed on the coast but me and Brummi had gone on the train whereas the others had gone in the car. After a 20 minute walk downhill from the train station, we met up with everyone else and got to the hotel. After than we decided to see what Southend had to offer and I wasn't particully impressed, it's probably a nice place to go in the summer but not particully in the middle of winter. Anyway, to the ground, after a 40 minute walk from the hotel to the ground, we finally arrived at half 1 and went in the club shop, there was nothing except the programme which took my fancy so we headed to the turnstiles, we were a fair bit early but the stewards and ticket takers were cool and let us in the ground early. So early infact we were in the ground before a lot of the stewards were. It was bitterly cold so we went into the make shift canteen. The ground was fairly average. 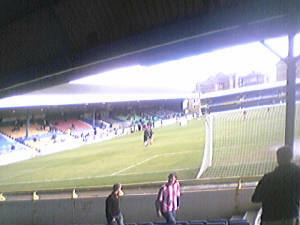 The away end, despite holding nearly 2700 was fairly poor offering a bad view of the action at the other end of the pitch and numerous posts made it a bit difficult to find a suitable seat to see all of the goal just infront of the stand. 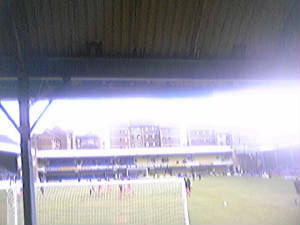 The stand to our right looked ready to fall down, not because it looked old but just because it had so many supporting pillars I imagine it's impossible to find a seat anywhere but the first few rows that didn't have a post in the way of your view somewhere. 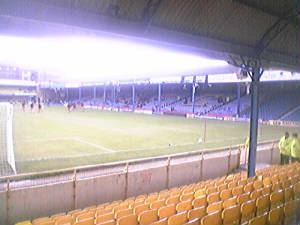 The far stand behind the other goal was fairly similar to the away end of Bradford, infact, it was identical except for the colours and I've only seen Colchester and Southend to have a smaller seating section in a stand than at Southend. The final stand made me thinking that they couldn't make their minds up which colour they want the stand, this was because every section was a different colour and looked very untidy. 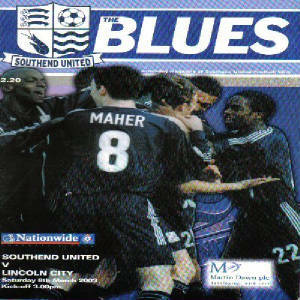 Overall Southend ok but it's definatly not one of the best that the league have to offer. Apparantly they're getting a new ground soon so let's hope it's better than this.